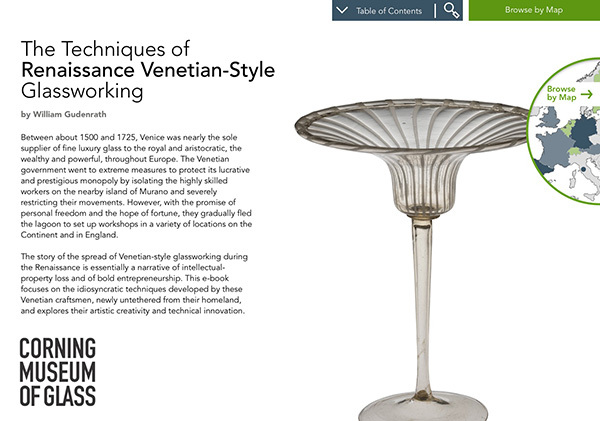 The bowl of this three-part goblet is made by using a pineapple dip mold. The object also includes a merese, a knop, and a foot. The process begins with a gather of glass on the end of a metal blowpipe. 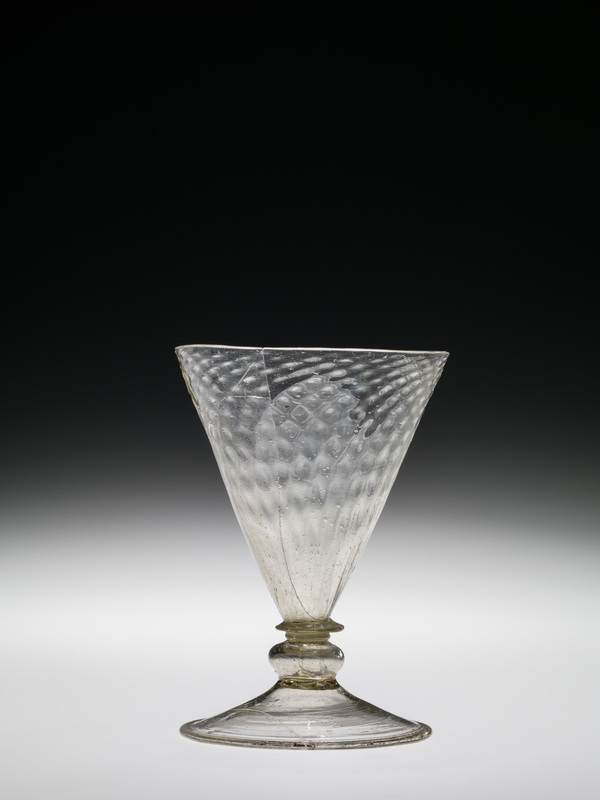 The glass is rolled back and forth on the marver to make the glass perfectly round and concentric. A bubble is blown in. The bubble is even-walled. It’s the same thickness on the sides and the bottom. It’s elongated and marvered to a slight taper.After reheating, the glass is lowered into the pineapple mold, blown very hard and lifted out. While blowing, the end of the bubble is pulled. A neck or constriction is made between the vessel body and the blowpipe.During reheating, the vessel is held down to allow gravity to elongate the bubble. The tip is trimmed and the lower part of the vessel is given its final conical shape. A small amount of glass is gathered from the furnace and added to the tip of the bowl. Using the jacks, the two-bladed tool, the glass is tooled or manipulated to form a disc known as a merese.Next the knop is made. It begins as a small gather of glass on the end of a blowpipe, its marvered and a bubble is blown into the glass. The bubble is lowered into place, carefully centering it on the tip of the merese. The bubble is cut free of the blowpipe and the excess glass is trimmed away. This is done by making a constriction, tooling the upper part of the knop and then breaking free the excess glass.Another bubble is brought in place and lowered onto the end of the knop. Here the connection is direct; there’s no merese. A constriction is made and this will allow the rim to be formed. 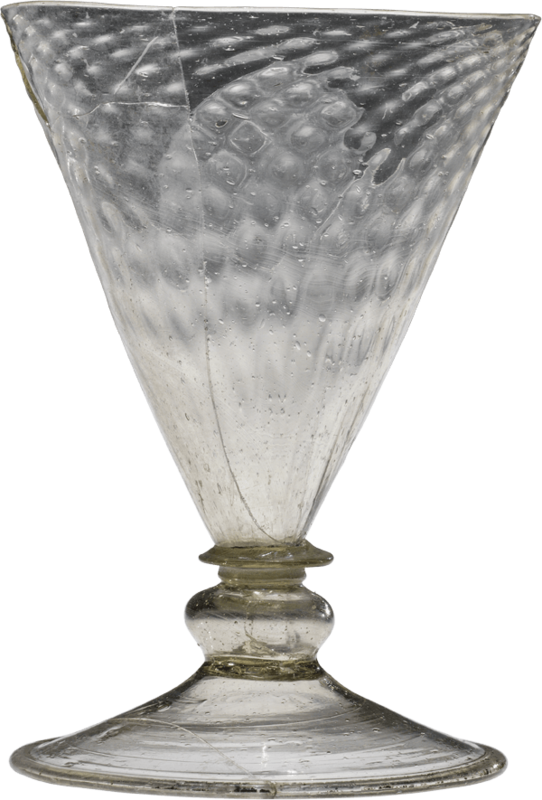 Excess glass is broken away, leaving a hole.During the process of making the foot, the entire vessel has to be kept well over 1000o Fahrenheit. After reheating the hole is enlarged, the knop is cooled with the sofietta. It unavoidably becomes softened during the reheat for the foot and the sofietta is used to enlarge and reshape the foot bubble. This vessel has a folded edge on the foot. It’s created by pushing the edge inward and lifting up with the jacks. The folded edge is double thickness and it gives strength as well as visual articulation of the edge.The punty site is cooled and a small amount of glass on the end of the metal rod, the punty, is attached at the base. The neck is broken and the vessel becomes free of the blowpipe. The opening process begins. After opening the hole to the diameter of about an inch and reheating it, the sofietta is used to shape the upper most part of the bowl. With more reheating and tooling, the glass is given its final shape.